Moving on to a great season of camping! Welcome back to the Great Divide! During the off season campgrounds usually are a quiet place just waiting for the first buds of spring. Instead the noise of chainsaws permeated the air of The Great Divide all winter while our maintenance staff cleared over 180 downed trees from Hurricane Sandy. Once the task of getting the roads opened was over the job of removing all of the leaning trees from the woods began. This brought down at least another 100 trees. Most of our seasonal campers were spared physical damage to their trailers from Sandy but a few decks and lawn ornaments fell victim to her! The start of the spring saw us rehanging electric wires and fixing many campsites that had been destroyed by debris and falling trees. It was a frantic race to the finish line for opening day and those that had seen the destruction are amazed with how fast our team cleared the destruction. 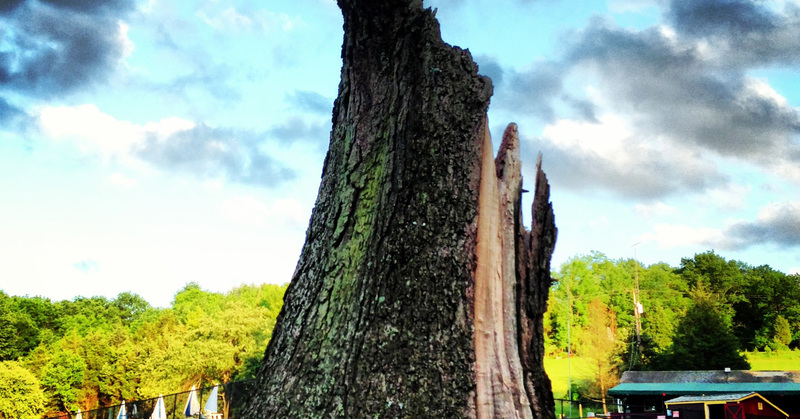 Our lasting reminder of the magnitude of the storm is the base of the destroyed, 200 year old, walnut tree standing defiant in the air. A reminder that as a team and an organization we can overcome any thing and we look forward to a future of many blue skies and happy weekends of camping!